The experts said it couldn’t be done, but because he trusted in God absolutely, the impossible happened. Originally, all the landscaping experts said that the Ambition Masterpiece Boulder couldn’t be placed at its current position. They said that it was too big and heavy to be lifted to its current location. But because Pastor Jung Myung Seok believed 100% in the inspiration God gave him and clung to God, the Ambition Masterpiece Boulder is able to sit where it is today. This is the deep story of how God helped Pastor Jung discover, transport and ultimately lift this 32 ton Ambition Masterpiece Boulder, despite it being a seemingly impossible task. One of the difficult tasks of building the rock landscape in Wolmyeongdong is finding good rocks. When Pastor Jung Myung Seok first worked on the rock landscape, he constructed the landscape with rocks that were buried in the ground and those lying around the village. However, it was difficult to find even one tenth of the rocks needed for construction just using this method. So Pastor Jung traveled around all of Korea with fellow church members, searching every nook and cranny, looking for rocks. There was practically no place in the entire country that Pastor Jung had not gone to find rocks. Furthermore, because rock prices were as expensive as gold, finding rocks that fit Pastor Jung’s budget was like picking a star out of the sky. But God helped Pastor Jung. It was during the process of obtaining the rocks that deep and profound stories with God were made. There are a couple of reasons why the Ambition Masterpiece Boulder is special. It is very big, has grass and a small tree growing on it, and has thick moss surrounding it. This is very rare for a boulder. Moss only begins to grow on a rock if it is over 300 years old. To have a cloth of moss (i.e., additional plants that grow on rocks) takes around 1000-5000 years of growth. The probability of a pine tree growing in the crack of a boulder is one in 10, 000 or 20, 000. But the Ambition Masterpiece Boulder miraculously possesses all of these rare and precious characteristics. Another interesting fact about the Ambition Masterpiece Boulder is that it actually has two parts to it – one 3 ton piece and one 29 ton piece. The process of how this rock was broken into two contains a deep story with God. The Ambition Masterpiece Boulder came to Wolmyeongdong after Pastor Jung had unsuccessfully tried to buy a rock he wanted from Boryeong (see note below) and after the Front Mountain Rock landscape crumbled five times. After receiving this inspiration, Pastor Jung promised God that even though the rocks crumbled, his heart would not crumble, and that he would build a better, more beautiful rock landscape. He then sent members to look for bigger and better rocks as a symbol of the Ambition Masterpiece. One member went here and there to find a rock that could symbolize the Ambition Masterpiece. However, it was difficult to buy the rock they wanted because of insufficient funds. That was when he saw the Ambition Masterpiece boulder and wanted to buy it. The owner said that if they could transport this big boulder, then they could take it. Funnily, the owner didn’t sell the boulder when Pastor Jung was constructing the Ambition Masterpiece for the fourth time. This time around, however, Pastor Jung was able to bring it in at a very cheap price. Note: We brought most of the rocks in the rock landscape in Wolmyeongdong from Boryeong, which is famous for ink stones. (Boryeong rock mines produce obsidian, which is the material for ink stones). Pastor Jung knew of the owners there and had bought a lot of rocks from there for the rock landscaping. Although Pastor Jung was able to buy the boulder at a cheap price, transporting the 32 ton boulder to Wolmyeongdong became a problem. Even though they called in a 50 ton crane, because the boulder was so heavy, the crane wavered a bit while lifting the boulder and the boulder split into two. The person responsible for transporting the boulder was really disappointed because he knew that natural rocks have to remain in its natural state to be of great value. He wasn’t sure what he should do, but ultimately decided to transport both pieces of the boulder. The big piece weighs 29 tons and the little one 3 tons, for a total of 32 tons. Further difficulties arose when the boulder finally arrived in Wolmyeongdong. The crane they were constructing with can lift a 19 ton load up to a height of 10 meters. 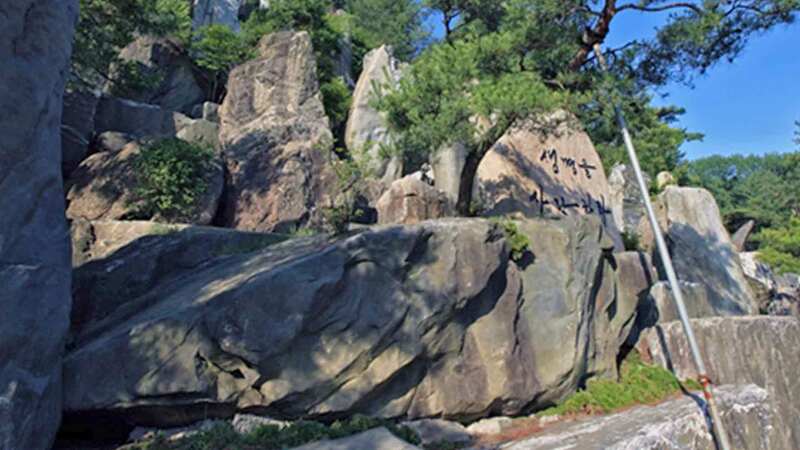 However, the place where Pastor Jung wanted to place the boulder was 15 meters high. Plus the boulder was 10 tons overweight. The crane operator said that it would be impossible to lift the boulder. If the crane boom breaks or is damaged while pushing the machine too hard, it would cost tens of thousands of dollars in damage. After this prayer, he told the crane operator that he would be responsible if the machine broke, and asked the crane operator to try the operation. The crane lifted the boulder and slowly moved it to its designed location. The back part of the crane started to rise, the boom started to curve, the engine sound got weaker and was about to turn off. They tried a couple more times, but consistently failed. At this point, they were only 2 meters, at most, from where they wanted to place the boulder. Pastor Jung promised the operator that they would try one last time, and if it really didn’t work, then they would quit and call for a bigger crane. The crane operator tried to cooperate as much as he could, but there seemed to be no other way out. Pastor Jung replied saying that he would take responsibility. Thus, the crane operator went back to the operator seat, and the excavator began to press down the back of the crane. But the engine fell into critical condition; it was turning on and off. The boom was bending like a fishing rod. The crane slowly climbed up, gasping for breath, while dozens of people watched on from the sports field. Everyone watched the dangerous and treacherous work with an anxious heart. Then the worker gave the signal to put the boulder down slowly. With a thump, we placed the boulder where we wanted it. It took a total of 5 hours to wrestle with the boulder. After the Ambition Masterpiece Boulder was successfully placed, the person who transported the boulder from Boryeong to Wolmyeongdong finally told Pastor Jung about the incident of the rock splitting apart into two. He didn’t tell him before because he was afraid that he would get in trouble. Pastor Jung realized that the rock breaking into two pieces was God’s Will. If the boulder didn’t break, then it would be too heavy for the crane to lift. That was why God made it break beforehand since He already knew the entire situation. If the 3 ton piece hadn’t broken off, the boulder would have had to be placed on the ground instead since it would have been too heavy for the crane. God and the Holy Son broke the boulder in order to place it where it is now. This was definitely something that God had to do. People would never have been able to break the boulder because they would feel that the boulder was too valuable. “People worry and get anxious when things do not turn out the way they expect, much like the boulder breaking. However, God has a Will and plan. He tries to make things more successful within every circumstance. Even though there is God’s plan, people fight out of conflict in ignorance because they judge according to their own thoughts. Therefore, we need to always pray and believe that He will make things more successful. We have to be faithful whether things turn out well or not. This boulder came after the Front Mountain Rock Landscape crumbled down 5 times. This was also the Will of God. This was the boulder that, before, the owner would not sell to us even though we offered more money. It is truly a boulder that God prepared. God knew that the rock landscape would crumble, so He made the owner sell this boulder at the right time – when we built the Ambition Masterpiece for the final time. If we had brought this boulder beforehand and placed it in the rock landscape, it would have crashed into another rock and broke when the rock landscape crumbled. Just as the Ambition Masterpiece Boulder contains a deep story with God, the other rocks in Wolmyeongdong all have a story with God as well. Just as God worked on the Ambition Masterpiece Boulder with His great Will, He also works upon us in the same way. The rock landscape had crumbled down five times already. However, because Pastor Jung relied absolutely on God, he and the volunteers finally completed the construction. This was possible because the Trinity protected us, loved us, moved us, and inspired us without rest. This is the most excellent introduction I’ve ever seen.